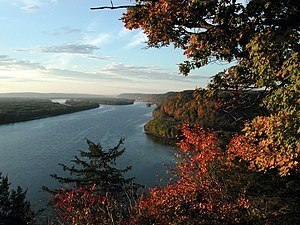 The Mississippi River is a river in the United States. It is one of the longest rivers in the world. Its Largest City is Memphis, Tennessee. The name "Mississippi" comes from a Native American name that means "big river." The source of the Mississippi is Lake Itasca in Minnesota, near the border with Canada. The Mississippi flows south through the middle of the United States. It flows through the states of Minnesota, Wisconsin, Iowa, Illinois, Missouri, Kentucky, Tennessee, Arkansas, and Mississippi. The mouth of the Mississippi is in the state of Louisiana, south of the city of New Orleans. The Mississippi flows into the Gulf of Mexico. At the end of the Mississippi there is a zone in the Gulf of Mexico where very few animals can survive comfortably because of the fertilizer and other chemicals that run off of farms into the river and its tributaries. The rivers then carry them into the gulf. The Mississippi has been very important for transportation in the history of the United States. In the 1800s, many steamboats traveled on the Mississippi River. St. Louis, Missouri, Memphis, Tennessee, and New Orleans were important port cities. The Mississippi has many large tributaries, or rivers that flow into it. The watershed of the Mississippi covers much of the United States. 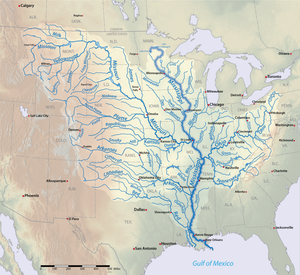 This means that the Mississippi and its tributaries drain much of the United States. A big part of the book Huckleberry Finn by Mark Twain is set on the Mississippi River. Twain also wrote a book called Life on the Mississippi, which had some stories about how he used to work on a steamboat. ↑ decolonialatlas (January 12, 2015). "The Headwaters of the Mississippi River in Ojibwe". Retrieved August 19, 2016. ↑ "AISRI Dictionary Database Search". ↑ "Myaamia Dictionary Search". Retrieved August 19, 2016. ↑ "English – Cheyenne". Retrieved August 19, 2016. ↑ "English – Kiowa". Retrieved August 19, 2016. ↑ "XML File of Arapaho Place Names". ↑ 9.0 9.1 Kammerer, J.C. (May 1990). "Largest Rivers in the United States". U.S. Geological Survey. Retrieved February 22, 2011. ↑ 10.0 10.1 Median of the 14,610 daily streamflows recorded by the USGS for the period 1967–2006. This page was last changed on 11 December 2018, at 13:30.